Over the years the PCO Mission Funds have helped support efforts to settle refugees to the mid-Michigan area. 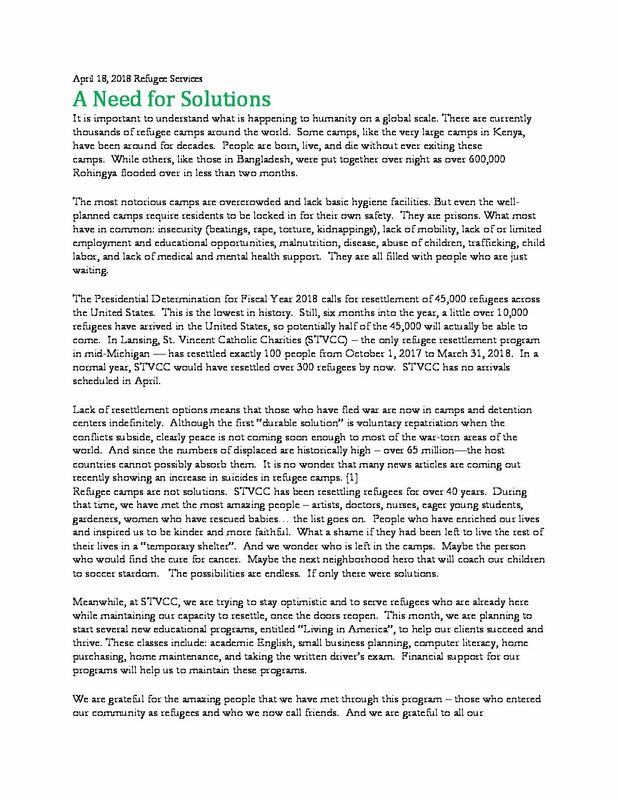 PCO donations are directed to St. Vincent’s Catholic Charities Refugee Services. Judi Harris, of PCO, is the director of Refugee Services. Once the refugees are settled, continued support is provided by STVCC for education efforts by such things as ESL, computer literacy, and home maintenance. Judi has provided an excellent summary of the current status of the refugee resettlement efforts. Thank you for your continued support for this vital service. For information from Judi Harris, see PCOrefugeeservices . The St. Vincent’s Catholic Charities website, http://stvcc.org/ .